In combination with 15 years of experience in development of special hi-end fertilisers, MORE has come up with an innovative solution and proudly presents its technological revolution in coir buffering: Coco Buffer Dose Unit. 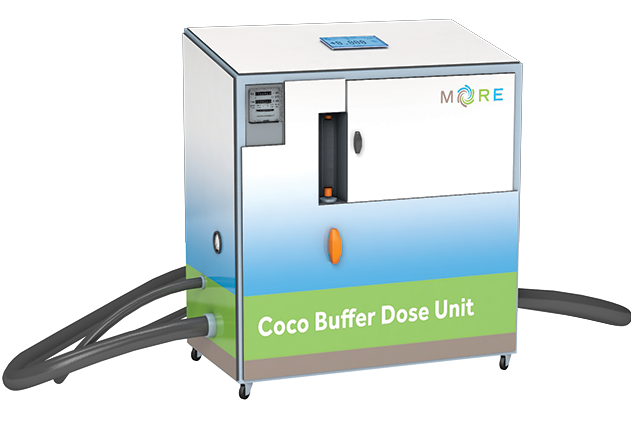 The Coco Buffer Dose Unit is a precise optimal dosing system, that allows you to save up to 80% of buffer agent, be 100% water efficient and reduce the amount of water used by 30%, compared to traditional buffering method. As a result you obtain coir that meets the the generally accepted quality standards, while saving your costs, natural resources and preventing water and soil contamination.